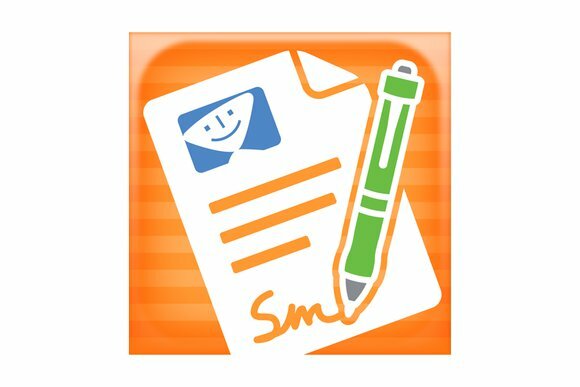 For me, Smile Software’s PDFpen for iPad ($15) and iPhone ($5) work as adjuncts to PDFpen Pro, the desktop version of the same app. Admittedly, it’s great to have quick access to portable versions of PDF editing tools almost anywhere I need them, but the iOS versions of PDFpen, while good, fall short of what they could and should be. PDFpen offers a collection of tools that make it easy for you to markup and edit your PDF documents. 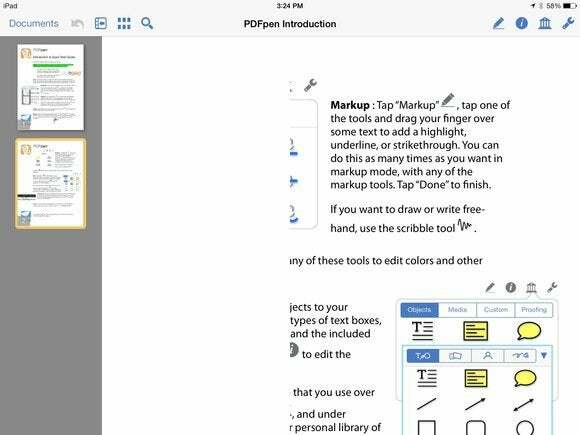 PDFpen for iPad and iPhone each offer an extensive set of tools for creating new PDF documents and marking up and editing the text in existing documents. But, while both the iPad and iPhone versions of the app offer the same features, they are in fact two distinct apps that must be purchased separately from the iTunes App Store. There seems to be no reason you can't use the iPhone version on the iPad—I was able to load the iPhone app on my iPad. But the iPad version is optimized for the iPad, with a much cleaner interface and tighter controls. Importing documents into PDFpen is easy. You can either import them directly from one several supported services, such as Dropbox, Evernote, Box, and Google Drive, or you can import documents using any app that supports iOS’s “Open in” feature. Alternatively you can create new documents using one of three templates, from a photo stored in your photo library, or using items on your device’s clipboard. Documents you create or import are stored using iCloud, but you also have the option of including other folders, such as a Dropbox folder, for syncing as well. Tapping any document opens it for editing in PDFpen, although the type of document you open will determine the editing features available to you within the app. For example, a PDF file created from a scanned image without OCR won’t have text that can be selected, while PDFs created directly from word processing documents or for which the text has been recognized using an OCR program will have selectable text. The apps also recognize documents that contain form fields and make entering data into those fields a snap. PDFpen recognizes and makes it easy to enter data into PDF forms. When a document is open, a title bar at the top offers access to a variety of document management and editing tools. On the left side are tools for undoing your last edit, displaying page thumbnails, and searching for text within the document. On the right are PDFpen’s markup, annotation, and setup tools. Selecting the Markup tool allows you to highlight, squiggle, underline, and strikethrough text or draw free-form objects and annotations on the page. After you’ve selected the markup tool, an Info button allows you to change the way the markup tool will work on the page. For example, if you’ve selected the freeform drawing tool, you can set the line style, width, and color. A Library tool provides a collection of pre-defined objects you can place on the page, options for inserting images from your photo library, and a standard collection of proofreading symbols. In addition, you can create and store custom items, such as a signature, for later use. If you’re using iCloud, any of the items you create and store in the Library will be available for use in other versions of PDFpen on other devices, including your Mac. If the text in your document is editable, when you select a line of text you’ll see an option to Correct Text. Choosing this option changes the entire line your cursor is on into an editable line of text. This tool allows for minor edits of one or two words in a single line, but cannot be used to edit entire paragraphs. And when working on sophisticated documents that include multiple columns or text boxes containing content unrelated to the text you’re editing, PDFpen often selected text across boundaries, making it impossible to make changes without affecting the unrelated text. While, overall, I am happy with the tools PDFpen offers for editing and marking up PDF documents, I am disappointed to report that I found both versions of the app to be rather buggy. I had a number of issues with the iPad app, including incompletely rendered pages, pages out of focus, and stuttering or multi-second pauses when scrolling up or down on a page. The iPhone app wasn’t much better. On my 5S scrolling was never an issue, but sometimes pages within documents appeared as blank pages, even though the thumbnails showed that there was text. I also found that if the text I was selecting was near the top of the document and therefore also near the toolbar, the iOS magnifying glass that shows where your cursor is displayed the text but did not show the cursor. While PDFpen offers excellent editing tools, it often mis-rendered pages, making them uneditable. 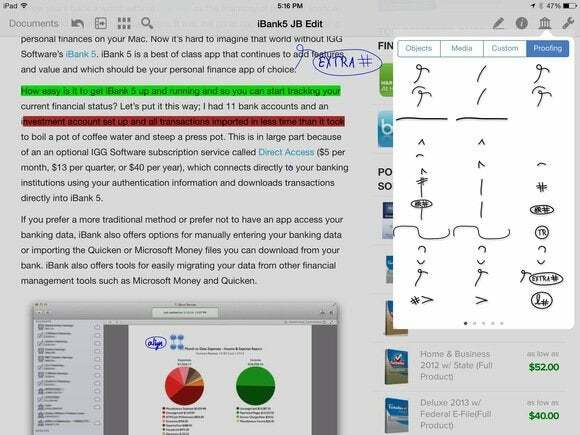 Version 1.7 of PDFpen for iPad and iPhone is a double-edged sword. It offers a number of powerful and useful tools for marking up and editing your PDF documents on your iOS device. But at present it is fraught with a number of intermittent and significant bugs that may render it difficult to use for its intended purpose. While I can recommend it as a great tool, you may want to wait for a future update to avoid potential frustration.